Fotoforms laser-cut graphics offer an exciting and dynamic way to grab attention, communicate your message, and display your product. In today’s world of marketing you need something that really “stands out”. 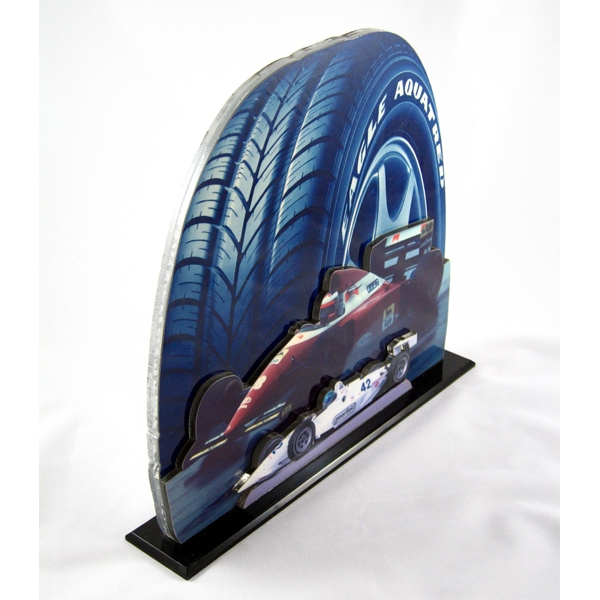 Fotoforms laser-cut graphics offer an exciting and dynamic way to grab attention, communicate your message, and display your product. Enhance your corporate image when your photos, logos, and graphics are laser-cut into Photo Cutouts, Logo Signs, and Displays. Fotoforms are a great value because quality, vibrant products get more attention and are displayed longer. Scroll through our portfolio and get some great ideas for your company. Fabulous Fotoforms works with your photos and graphics to create Photo Cutouts (also called Photo Statuettes or Picture Statuettes) Photo Trophies, 3-D Photo Popouts, Customized Photo Puzzles, Standard Photo Puzzles, Logo Signs and much more. We laminate, mount, and laser-cut your images to create unique, one-of-a-kind dynamic displays. Far better than framing and rectangular prints, Fotoforms adds an extra dimension to your graphics and images.